This is NOT a photo of us! No way would you get me up there parasailing. On our cruise last year I managed to fight my fear of heights to do rock-climbing, but this is just a little too much. 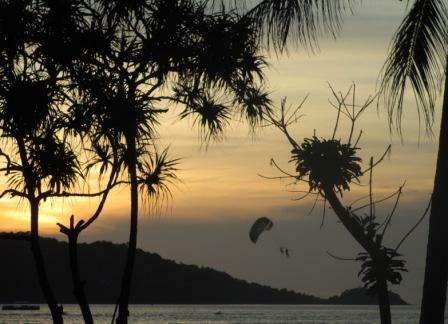 This entry was posted in Activities, Photography, Thailand and tagged parasailing photo, rock climbing, sunset photo, Thailand. Bookmark the permalink. We have parasailed in Jamaica….loved it, although had to overcome my fear, as you did. It is an amazing experience. The rock climbing was enough for me. I can’t imagine ever parasailing.